Fraser Robinson III was not really famous in life. But he was the First Lady-Elect, Michelle Obama's dad. He was able to live with multiple sclerosis, maintain a relationship and work while raising a family. To Cir and I, this is such an admirable thing. Fraser was born on August 1, 1935 in Chicago, Illinois. He grew up there and married Marianne Shields who was also born in Chicago. They had two children, Craig and Michelle LaVaughn, who they raised on the southside of Chicago. Fraser was a pump worker for the City of Chicago. He tended the boilers at a water-filtration plant. On the 2008 campaign trail, we learned from both Barack and Michelle, that Mr. Robinson developed multiple sclerosis as a young man. In spite of having this disease, he continued working and according to Michelle, he hardly ever missed a day of work. Michelle told how she would see her father walk to work using two canes. Even though he had to sometimes struggle to get ready for work, he knew this was what he needed to do. Certain things just took a little longer for him. He was also active on the political front. Mr. Robinson was a Democratic Precinct Captain. Michelle and her brother, Craig looked up to their dad as their hero. They worked hard not to disappoint him. Both Fraser and Marianne valued hard work, independence, and honesty. They worked together to instill these values in their children. Craig tells the story of how he and Michelle ended up attending Princeton after they finished high school. "Coming out of high school, Robinson was heavily recruited by both the University of Washington and Princeton. The former was offering a full ride, Princeton a financial-aid package that would leave his parents with a bill of $3,500 per year. "It might as well have been a million dollars," Robinson says. He told his father, Fraser Robinson, that he wanted to go to Washington. His father asked why, and Craig said he didn't want his parents to have to pay anything. The response prompted his father to drop his head, and shake it. "If you pick a school based on what I have to pay, I'll be very disappointed," Fraser Robinson told his son. Fraser Robinson suffered from multiple sclerosis, an affliction that did not stop him from going to work every day in Chicago's water department. He was a man that you desperately did not want to disappoint. Fraser Robinson's son wound up at Princeton, his parents funding it with cash from an insurance policy and a credit card. Says Craig now, "My father's decision changed my whole life. It changed all of our lives. If I hadn't gone to Princeton, my sister probably wouldn't have gone to Princeton and she never would've met Barack and none of this would've happened. All because of my father." Multiple sclerosis is sure to get a lot of exposure as a result of the Obama connection. It would be very good if Michelle would make it one of her causes. But even if she doesn't, the fact that her dad had MS will probably make many more people aware of it. 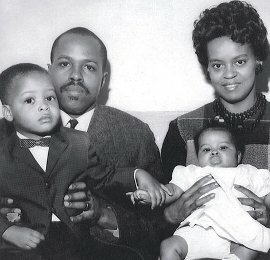 Michelle Obama and her brother Craig Robinson had a great role model or hero in their dad. I wish he would have had the chance to see his little girl in the position she will soon take as First Lady. 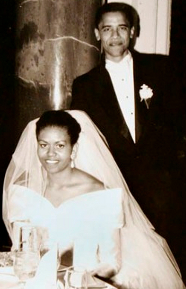 He died in March of 1991 before she married Barack. I'm sure Mr. Robinson would be proud to know all that his daughter has accomplished. Here's a short video biography of Michelle as narrated by her mom. You'll see a picture of her father at the beginning. Go back to Famous People with MS.